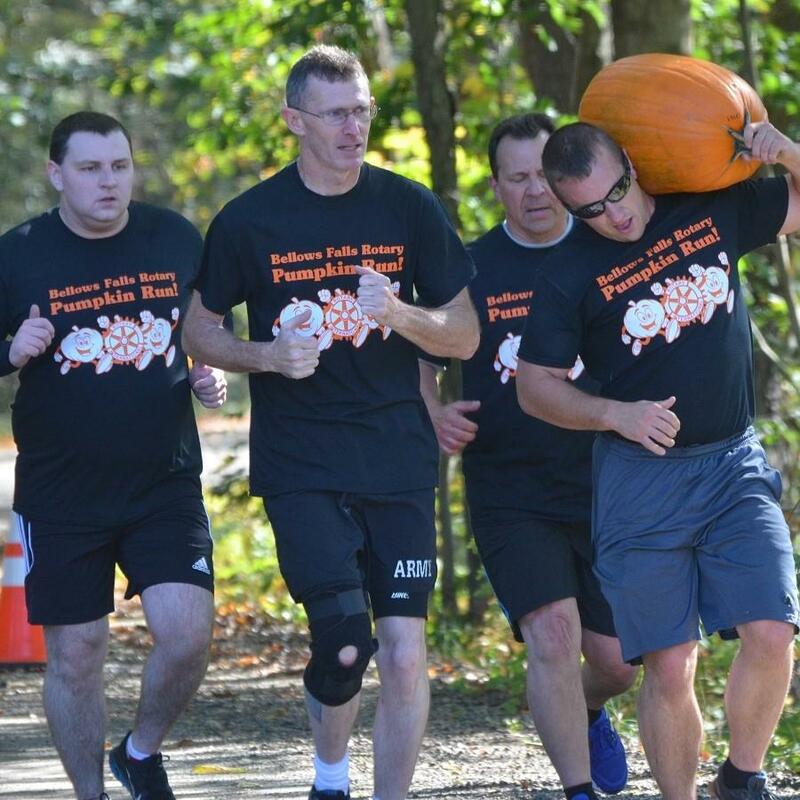 Are you tough enough to carry a pumpkin while running a 5K obstacle course? Basic Concept: To complete a 5K (3.1 mile) obstacle course (10 obstacles) while carrying a pumpkin. The runners must finish the course with an undamaged gourd. Rule 1: Have Fun! If you are not having fun, you are doing something wrong. Laughter is not only tolerated, but is encouraged. Rule 2: Complete the entire 5k distance while carrying a pumpkin. Penalty if the pumpkin crosses the finish line in a damaged condition. Minor scrapes and bruises of the pumpkin and runner are permissible. Cracks or Open wounds are not permissible. If the “brains” of your pumpkin are visible that would be a penalty. If the runner’s brains are visible, he or she forgot Rule 1. Runners can return to the start/finish line and purchase a “mulligan” pumpkin. Rule 3: Successfully complete all 10 obstacles. Volunteers will be at each obstacle to answer any questions runners may have about the obstacle. They will also note any runner that does not complete the obstacle. If a runner tries to avoid an obstacle he or she apparently forgot the concept of the run. Rule 4: Minimum Pumpkin Weight. Individual Runner: 8 lbs. Pairs: 11 lbs. Team (3 or more runners) 15 lbs. Penalty for failing to meet the minimum weight is 10 seconds per ounce under the minimum weight added to time. Pumpkins will be numbered prior to the run and weighed after the run. Pick your pumpkin wisely. Rule 5: No specialized equipment for the carrying of the pumpkin during the run. No bags, boxes, slings, handles, backpacks etc. Runners cannot utilize any protection to prevent any damage to the pumpkin. For example; placing a helmet on the pumpkin would be a violation. If the runner wants to wear a helmet that is okay. Runners are to use hands and or arms for carrying the pumpkin. If runners feel up to it they can balance the pumpkin on their heads. Remember Rule 2! Rule 6: Costumes are encouraged. Prizes awarded for best costumes. Costumes need to be family appropriate. Any costume deemed inappropriate will preclude the runner from participating in the run. All runners must complete the obstacle. If participating as a pair or team only one runner must carry the pumpkin through or over the obstacles. Candy Corn Run: 10 staggered traffic cones (runner must hold pumpkin above his or her head) The total distance of the Candy Corn Run is 100 feet. Hay bail “roll over” . This obstacle is a stack of hay bails set up in a step form. Participants must cross over the obstacles without standing or stepping on the bails. The pumpkin cannot touch the hay bails. Water slosh: Participants cross the Saxtons River. High/Low crawl : 6 staggered rails of various heights. The runner must go over or under as required. Pumpkin is not allowed to touch the ground. Pumpkin Troll Bridge: an incline/declined bridge. The participant must roll the pumpkin up, across and down the bridge. Participants must maintain control of the pumpkin at all times. Be careful not to damage your pumpkin on this one. “Too Much Cider” Balance Obstacle (2 ea 8ft 4x4 beams) placed with an approximately 45 degree angle between the two beams. Runners must not step off the beams. If a runner steps off they must redo the obstacle. Sounds easy, but be wary! Spider Web crawl: Requires the runner(s) to be on his/her hands and knees and push the pumpkin through the 20-foot-wide by 30-foot-long webbed obstacle. Touch the web and the spider will send you back to the beginning. The Scary Wood: Runners run through an off-road trail for approximately 400 meters. The trail is narrow with natural obstacles such as roots, rocks, and fallen logs. Monster Mash – Runners must navigate a narrow-cordoned area filled with “Monsters” trying to slow runners and attempt to have them drop their pumpkins.